Welcome to the recon, ladies and gentlemen. In today’s lesson you will learn how and where to deploy your scout teams, target allocation, and the types of recon elements available to the WARPAC and NATO forces. So listen up, take notes, and hold the questions until the end. Recon is an essential part of any battlegroup. By either scouting ahead of the main advance or giving you the first sign of an enemy approaching to your defensive position, recon is the eyes and ears of your force. How does this apply in game? First off, during the all-important deployment phase most recon units give you access to Scout and Spearhead special rules enabling you to get closer to the enemy, and at the same time extending your deployment zone. In practice, this means a Scorpion Troop deploys first on the 12”/30cm line then uses ether a tactical or terrain dash to move forward. Remembering that a team using the Spearhead rule must not end up closer that 16”/40cm to an enemy team from which it is not concealed, or 8”/20cm to any enemy team. Enemy deployment zone and objectives count as teams for the purpose of determining where the unit will end up. 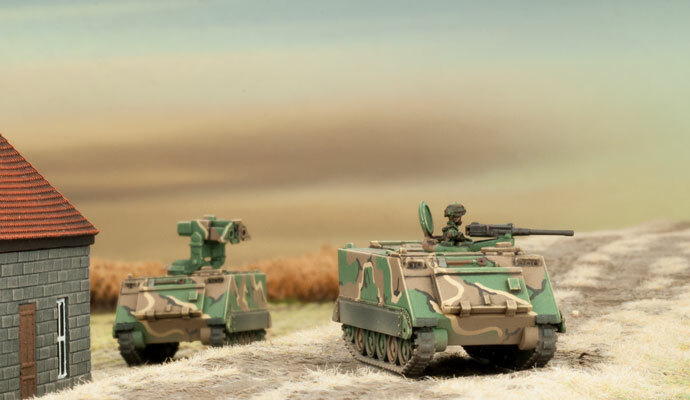 With this in mind, the Scorpion Troop has deployed in a woods concealed 8”/20cm from the enemy deployment zone and increases your deployment zone, as any unit may deploy within 8”/20cm of the Scorpion Troop. This alone now forces the enemy commander to re-think where to deploy his force as you have seized the initiative away from the them and can now confidently deploy with the upper hand. This is probably the most potent use of your recon units and one that will be quite common. Now we come to target allocation— what units your recon teams can or should engage. Without the anti-tank firepower to take on heavily armoured units, tanks are more often than not best avoided as they are the quickest way to lose your Scout units. Good targets of recon units include infantry fighting vehicles, other recon teams, artillery pieces, and anti-air units. Infantry should be second priority, as you have the range and weight of fire to pin them for your own infantry to get close enough to assault. This also allows you to pin any ATGM teams, hopefully reducing any chance of return fire from them. Now onto the part you have all been waiting for— the units themselves. WARPAC forces have available to them, the BRDM, BMP 1, and the BMP 2. All of them have Spearhead. The East Germans have the BRDM and the BMP 1 compared to the Soviets, who get the addition of the BMP 2. Points-wise the BRDM is the cheapest option at two for 1pt and four for 2pts.The BRDM has a good ROF for pinning infantry but its anti-tank is lacking against heavier units. Next up, the BMP 1, Starting at two for 2pts and going to four at 4pts. the BMP 1 is the top choice for WARPAC recon as it’s cheap and comes with the AT -3 Sagger missile. This allows you to hit tanks from range. While its main gun lacks the ROF of the BRDM it makes up for it in the AT and FP but can still deal out the pain to infantry with its 7.62mm MG. Last of all, the BMP 2. It’s the most expensive of the three and only available to the Soviets. It comes in at two for 3pts and four for 6pts however it’s easy to see why. The BMP 2 has a great main gun with a good ROF and AT but also gets the addition of a stabilizer and anti-helicopter rules. Versatility on the move and the upgraded AT-5 Spandrel missile, make this recon unit the best on points value when compared to the NATO recon units. The BMP 2 is an excellent all-rounder for the WARPAC forces. NATO recon units vary as there are many nations each with they own recon. We’ll start with the West Germans, who have available to them the Luchs. At two for 1pt, it’s one of the cheapest options available to NATO forces, however it lacks the numbers to engage properly and should be relegated to a scouting and harassing role. Its gun has a good rate of fire and a high enough AT to take out IFVs and to pin infantry. The Luchs main role should be to spearhead early and get some of the main force close early. 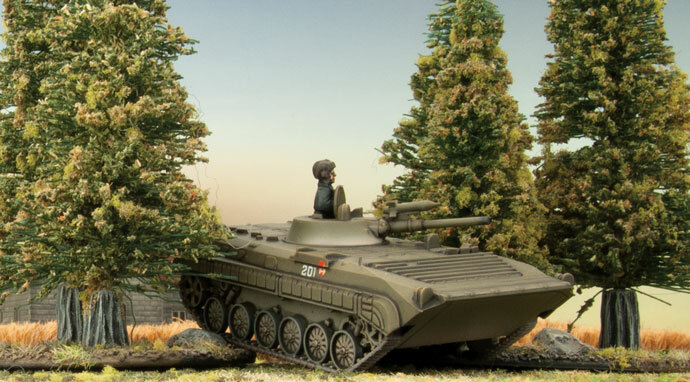 British are next on the list with the options of the Scimitar and Scorpion. The Scimitar has a good rate of fire and AT for its main gun and should be used similar to the West German Luchs. The Scorpion has Great FP and AT for hitting side armour of tanks but requires you to get in to position early to get the full ROF from its gun. The Scorpion is a good team for going after IFVs and other soft skin vehicles as its AT and FP should be able to get rid of them quickly. Both options are two for 2pts and four for 4pts.en after firing, remain gone to ground. If the enemy has few or no tanks, ATGMs should be the priority targets. Americans forces have a similar range to WARPAC in both the Army and the Marines. The LAV works the same way as the BMP 2 but lacks the ATGM as well as a decrease to its AT and the loss of stabilizers. The LAV should be used just like the Scimitar. An alternative choice is the Humvee scout, which is quite versatile with three different weapon options. These squads should look for targets of opportunity and should only engage if there the will be a small chance of return fire. At three for 2pts they are a good cheap option with decent tactical capability. Now onto the Free Nations of France, Canada, Dutch and ANZACs. The Canadian Lynx is a 1pt more the Luchs but has better armour. The gun is the humble .50 Cal with a good ROF and should really be used like the Luchs but should avoid engagements with other IFVss, as it lacks the number for a stand up fight. The French have the most expensive of all the recon units available to both the NATO and WARPAC, the AMX-10 RC coming in at three for 7pts and four for 9pts .This unit has a big gun in the form of the F2 105mm, with the ability to shoot from range with the help of the laser rangefinder and Brutal special rule to help dig out pesky infantry from their foxholes. However, the AMX-10 RC lakes the armour to be a tank and should not try to engage in a stand up fight against them. The AMX-10 RC should be used on the extreme flanks to spearhead and try to get off a few early side shots on tanks before retreating to cover before return fire gets them. The Dutch work the same as the Luchs but gain the addition of Anti Helicopter. Not bad at two for 2pts. The ANZACs get two option in the form of the Aussie Cav troop and the Kiwi Scorpion. The Kiwis are the same as the Brits. The Aussies get the largest option of the recon unit of both forces in the form of three M113’s for 3pt up to four M113’s and a MRV for 5pts. The M113’s work the same as the Canadian Lynx but have the weight of ROF due to numbers. The MRV in the Troop is the same as a Scorpion but with the Addition of Brutal and armour of the M113. This unit should concentrate on getting rid of dug in infantry. So that concludes today's lesson. Best of luck to you out there. Happy scouting, class dismissed.